Building a safe, fun and comfortable environment for your degu is the first step to becoming a responsible owner. When taken care of, degus can be some of the most exciting and fun small pets to own, especially if they have a lot of room to roam around and play. If you’ve decided that a degu is an ideal pet for your family, you’re going to need to find a good cage, which can be quite difficult and time consuming. This guide to the best degu cages of 2018 is designed to make the process easy and help you to find the perfect habitat for your small animal. How to build a degu cage? How big should a degu cage be? What is the minimum size for a hamster cage? 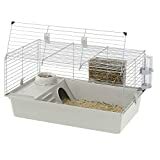 What to put in a hamster cage? 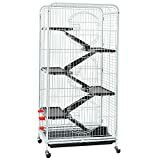 Standalone critter cages can be a great choice for pet owners who have a lot of space for their small pets. The Midwest Critter Nation Habitat is the ideal place for your degu as it gives them more than enough space to run around, relax and keep themselves entertained. Half-inch wire spacing: If your degu decides that it wants to climb, you’ll love the fact that the entire habitat has a half inch of space in between all of the horizontal wires so they can climb safely and easily. Adjustable shelves: Instead of having to stick with a predesigned cage that you can’t customize based on the needs of your pet, you’ll love the adjustable shelves that allow you to change the heights of all of the levels. Safety ramp covers: To help prevent slips and injuries, all of the ramps inside of the Midwest Critter Nation Habitat are designed with a “Happy Feet Ramp Cover” which helps to protect your degu’s feet with the help of non-slip traction paths. Easy to clean: Arguably one of the most difficult parts of owning small pets is cleaning. You won’t have to spend hours cleaning this cage as you have access to double wide doors and shelves that you can remove entirely for a deep clean. Easy to accessorize: All of the shelves offer three different height adjustments, which is great if you want to hang different types of toys and treats from the side of the habitat. You’ll have far more control over the things you put in the habitat than with other models. Sturdy and reliable: Once you have constructed the cage, the first thing you’re going to notice is how sturdy and reliable it feels which is great for people who have been used unreliable habitats in the past. Difficult to assemble: In comparison to traditional tabletop cages, the Midwest Critter Nation Habitat will be difficult to put together. Shallow litter pans: The vast majority of small pets require deep litter pans to collect their waste. Unfortunately, this model only comes with a shallow litter pan which means you’ll have to clean it quite often. As a more traditional type of habitat that you can choose for your degu, the Ferplast Pig Cage is ideal for people who don’t have a lot of space to house a vertical unit. There are plenty of great things about this particular cage, such as the fact that it has a simple design that is easy for anyone to use. Opening front door: To help make cleaning easier and less time-consuming, the entire front of the cage opens easily, giving you access to the entire cage. Removable base: As the metal grated top attaches to the bottom of the unit, you’ll easily be able to remove it, which is another great cleaning feature. Easy to set up: Instead of having to spend hours trying to affix shelves to the outside of the cage, this particular habitat is incredibly easy to assemble. Ideal size for one animal: Even though you might be concerned about its size at first, the Ferplast Pig Cage is great for one degu at a time as it has the perfect amount of space for a covered sleeping area, an exercise area and a play area. Too small for two degus: Depending on the number of pets you intend on owning, you certainly won’t be able to keep two degus in this habitat comfortably without having to worry about territorial issues. Unreliable accessories: Although the accessories that come with the cage are useful at first, as you begin to use them regularly you’ll find several problems with them, such as that the water bottle never stays on the holder and the food bowl may be too big. With a similar design to the Ferplast Pig Cage, the Living World Deluxe Habitat excels where other traditional tabletop cages may fail. With its high-quality construction and accessible features, it’s a great option for all small pets, especially degus. Hybrid cage design: With a plastic base and a wireframe upper body, you’ll be able to provide your pets with a ventilated, safe and comfortable environment. Accessible areas: With the combination of a hidden resting area, an accessible second level and the typical bottom floor, there are plenty of different places for your pets to relax and play. Tool-free assembly: If you’re ready to have your new pet’s home put together immediately, you’ll appreciate that the Living World Deluxe Habitat can be constructed without the use of any tools and within a matter of minutes. Safety latch when opening: Instead of a traditional wire door that simply slides open and is dangerous for your pets, there is a small metal bar that needs to be raised prior to opening the front door. Spacious: Unlike other tabletop wire cages that only have enough space for one degu, you’ll easily be able to fit two in the same space without any issues. Also, this particular model comes in an even larger size, which might be more comfortable for more than one pet. 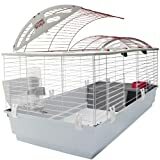 Easy to carry: In the event that you need to transport your cage from one area to another, you’ll appreciate how lightweight the cage is, especially as it is larger than what you would expect from a traditional wire cage. Difficult to clean: Although its design suggests that it would be easy to clean, it all depends on the amount of waste you allow to accumulate in the cage. A tip for saving time on cleaning is to leave a puppy pad on the bottom of the cage with the bedding on top, so when you clean you just remove the pad. Otherwise, you’ll have to completely empty the cage and clean every corner once a week. Poorly constructed accessories: Even though the Living World Deluxe Habitat is designed to give your degu a comfortable place to live as soon as you unbox it, the accessories aren’t reliable and sometimes even the water bottle won’t work, causing your pets to become frustrated. Giving your pets a lot of space can be a great way to make sure they’re getting enough exercise on a daily basis. However, you will need a larger cage with a lot of floor space. The Yaheetech 6 Level Ferret Cage surely will give your degus more than enough room to experience luxury and freedom, and it takes the idea of a large cage to a whole new level. Multiple levels: By far, the most noticeable highlight of this habitat is that it offers five different shelves, five separate ramps and a slide-out tray. Multiple doors: Another interesting feature that can not only make it easier to clean the cage but also hang toys and accessories is the doors. There are three oversized doors on the front of the cage, allowing you to easily access every level in the cage. One-inch bar spacing: To give your pets enough space to climb around the cage without falling through or getting stuck, all of the bars are specifically designed with one-inch bar spacing. 【Extra Large Exercise Place】Spacious pet cage provides room for even the most energetic adult ferret.Dimension: 25.2 x 16.9 x 51.6'' (LxWxH),Ramp Size:12.4 x 5.1'' (LxW),Shelf Size:16.1 x 8.7'' (LxW). 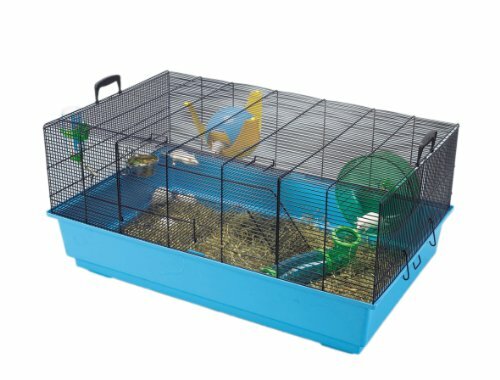 【Durable & Sturdy Pet Cage】The cage for large rat is constructed with the high quality 0.5'' metal square tubes and 0.2'' wires; features 4 heavy duty casters at the bottom guarantee high load capacity. 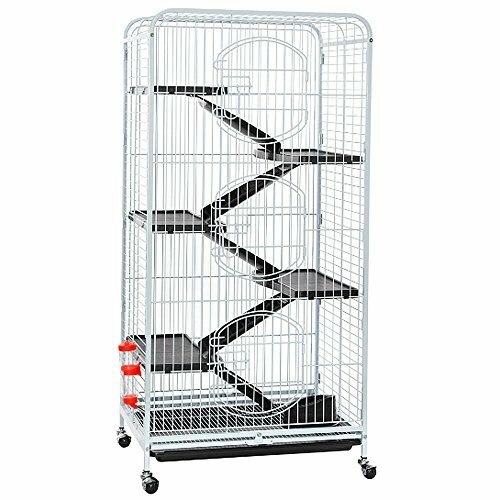 【Free Accessories】Ferret Cage includes 5 shelves, 5 ramps, 1 slide-out tray, 250ml water bottle and plastic food box. 【Safe & Secure Bunny Cage】All three arched doors are secured with latches, keeping your pets safe in the cage.Thoughtful 0.9'' bar spacing avoids any undesired caught or stuck. 【Easy Cleaning & Feeding】3 oversized front arched doors on chinchilla cage provide maximum accessibility for easy cleaning & feeding. Easy to build: Even though you would assume that a large cage would take time to assemble, this particular design is incredibly easy to build and can be set up within six minutes. There aren’t any special tools needed as the kit comes with an Allen key. 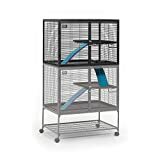 Enough space for accessories: Instead of having to worry about whether you can fit wheels in the cage or hang treats or accessories, there is enough room for everything you’d like to accessorize with. Poorly made ramps: In the event that you have a relatively rambunctious degu, you might experience some issues with the ramps as they seem to be made out of thin plastic that breaks easily. 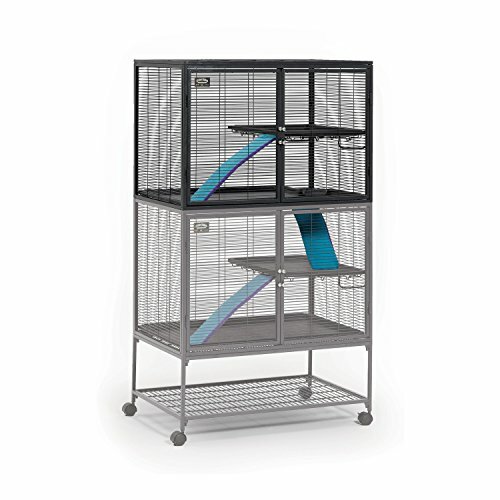 If you’re looking for a habitat that is more functional and user-friendly than anything else, you’ll surely appreciate the Lixit Animal Care Cage. It has a very basic design which is great for people who aren’t interested in dealing with added bells and whistles that would make a cage more difficult to put together and maintain. Solid metal cage: Instead of having to worry about wire cages that easily bend, all of the metal used in this habitat is solid, giving your pets a safe place to live. Included accessories: There are plenty of accessories that come with the Lixit Animal Care Cage that make it immediately ready to use as soon as you unbox it. You’ll have access to a drinking bottle, exercise wheel, bowl and house. Easy to clean: With the ability to completely remove the base of the cage, you’ll have an easier time cleaning the cage. Great for small spaces: In comparison to other wire cages that are larger in size, this is the ideal model for small areas. With that being said, you’ll only be able to fit a single degu in it at a time. Useful for tiny to medium animals: The spacing in between the wire bars is perfect for both tiny pets such as miniature hamsters and medium pets such as degus. If you intend on using the same cage for several years, it is incredibly versatile. Defective accessories: If you intend on using the included accessories for the entirety of the cage’s lifetime, you will find that they are constructed using inexpensive materials that have the tendency to break. Choosing an animal cage is not just about finding a design that looks great in your home—it has to be comfortable and safe for your pet degu as well. There are many things to think about when you first start searching for the perfect model, ranging from the dimensions of the cage to its usage. The first thing you need to think about is where you’re going to place your cage, as this will determine the dimensions you should be looking for. The best part is that there are several different types of cages that are designed for different areas of your home, such as standalone cages, tabletop cages and desktop cages. It’s always best to take the time to measure where you want the cage to go and then find the appropriate habitat that will fit it. Otherwise, you may end up in a situation where you have to arrange your furniture around your new degu habitat. As another feature that is entirely dependent on your lifestyle and how you intend on using your cage, you’re going to need to take weight into consideration. If you’re in the market for a habitat that you can bring with you on your travels, you’re going want a lightweight design. On the other hand, if you have a specific place in your home where the cage will remain for the entirety of your pet’s lifetime, you can opt for heavier models. When it comes to degu habitats, you’re going to need to find materials that are resilient, easy for them to climb on and easy to clean, such as solid metals and plastic. Degus can be extremely active small pets, which means all of the ramps, ledges and shelves inside of your cage should be built to last and not made out of cheap plastic. You’re also going to want to make sure that the metal used to build the cage isn’t prone to rust, especially if you intend on cleaning the habitat with water on a regular basis. Ideally, you’re going to want a litter tray at the bottom of the cage that is made out of plastic so that cleaning all of your degu’s waste is quick and easy. Multiple levels: To give your degu more opportunities for playtime and exercise, multiple levels inside of the cage are necessary. Sleeping area: Some cages also come with a little house where your degu can rest when they get tired. This gives them a safe and reliable place to rest their head without having to worry about intruding light or strangers hovering around their cage. Food bowl and water dispenser: As long as you are able to find a cage that comes with reliable accessories, a food bowl and water dispenser can be great to have as it means you won’t have to buy any on your own. Ideally, you’re going to want a non-tip bowl and a water dispenser that is large enough for a degu. Similar to what we discussed in product dimensions, deciding on the size of the cage is important, especially if you have a relatively small area to work with. You also need to take the needs of your degu into account as you’ll want to make sure that their habitat isn’t so large that they get lonely or so small that they feel claustrophobic. Another important thing to think about is whether or not you intend on purchasing another degu as a partner for your existing pet, as a larger cage will be needed for two or more pets. It’s important to remember that every degu cage is different and therefore their assembly instructions are going to differ. In most cases, you will need to have a base, a metal top and any toys or treats that you’ll want to hang on the sides. In order to make sure that you put the cage together quickly and safely, always refer to the assembly instructions that are provided with the habitat you’ve purchased. Bedding materials: It’s imperative that you add absorbent bedding materials to the bottom of the cage. Avoid using wood shavings as they can harbor fungus. Branches: Degus absolutely love to climb, especially if you have one with a vibrant personality. It’s a good idea to safely affix strong and thick branches throughout your cage with the help of zip ties. Carpeting/cardboard: Another interesting feature of a degu is that they have relatively sensitive feet and if you have a cage with metal racks as shelves, you might want to consider covering them with cardboard and carpet to make their habitat more comfortable. As a small pet that is incredibly active, you can guarantee that your degu is going to want to run and climb around their cage as often as possible. The minimum height for a degu cage should be around four feet high and three feet long, as anything less than that won’t give them enough space to express their instinctual need to climb. However, if you have a relatively slow and more relaxed degu, you can get away with using a smaller cage, such as one designed for a hamster. It’s always important to consider the needs of your pet before deciding on their ideal habitat. Hamsters can be phenomenal pets. However, they do require a sufficient amount of space for exercise, socializing, playtime and sleeping. The minimum size for any hamster cage is approximately two feet long by one foot wide, but if you decide that you want a larger cage it’s always better to choose a longer one rather than a taller one with unused space at the top. Once you have an idea of what you should be looking for when it comes to a degu cage, it’s easy to see how the Yaheetech 6 Level Ferret Cage is the best model on the market. Its design is ideal for a small animal that enjoys climbing, running around and playing with toys. However, you may have to secure some of the ramps with zip ties to ensure it’s safe over a long period of time. Another great aspect of this particular habitat is that although it is large, it has wheels on its base which makes it quite simple to move around from one area to another. You’ll easily be able to transport your pet from different rooms and you can easily move the cage for cleaning. There are also oversized doors on the front of the cage that make it easy to access the hard-to-reach areas for cleaning. At the end of the day, choosing the perfect degu housing is all based on your personal preference and the preference of your pet. With the right knowledge and advice, you’ll be able to create the ideal environment for the newest addition to your family.